Funny what you can learn on a bike. 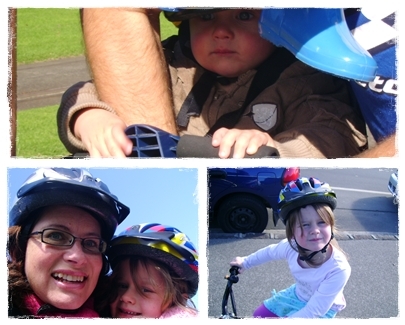 Yesterday in between showers, the hubby decided to get our housebound lot out of the house and onto bikes. We've got enough of them in our garage for a small army. Open our garage door and bikes come out to greet you: Hand-me-down bikes, bargain bikes, birthday bikes, three wheeled trikes, plastic rideons, and a Dora scooter. Take your pick. Hurry Hurry, says Daddy as the kids scramble to find their helmets. Two-year-old Scrag rattles around proudly on his Triang trike (with trailer attached), smug in the knowledge that his helmet is already on his head and he's ready to go. One by one the troops mount up. Yes, even Mummy. One of those renegade bargain bikes has my name on it. Out the gate single file. There's Dash on his TradeMe bargain bike. There's Miss Fab on her sparkly pink birthday bike. Oops Scrag, honey. You can't ride your trike where we're going today. You're going on the seat on the back of Daddy's bike. "Nooooooo! I wanna go on my bike! I not go on daddy's bike!" Arms flailing, legs kicking as daddy lifts him off the trike and deposits him in the "baby seat". The humiliation. The shame. The disappointment. 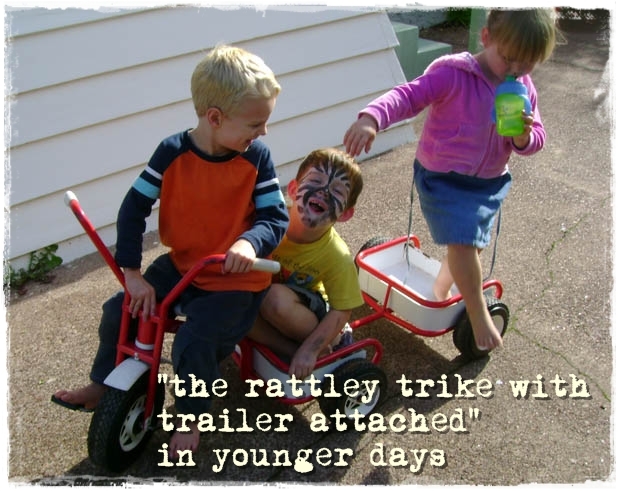 Scrag thought he was bringing the rattley trike with trailer attached. It hurts, oh how it hurts to be left out. 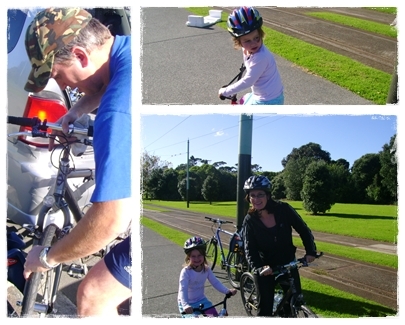 Can you picture Team G with Scrag on his trike, riding through the streets of Mt Albert? Can you just see us riding up the Unitec hill? Sorry Scrag, that dream is not for today. You have to wait until you're a bigger boy. Last night in bed, Mr G pointed out to me the life lesson he got from this funny little story. "I was thinking," he said, "How much we sometimes do what Scrag did today." We get our hearts set on something, something we think we can cope with, something we are sure is going to happen for us, right now, a certain way. And when our Wise Father says, no you aren't ready for that yet, we throw a little tantrum. "It's not fair! He's doing it! She's doing it! Why can't I???" we protest indignantly. Problem is that He knows us better than we do. He knows our abilities - and our limitations. And He knows what's around the corner. 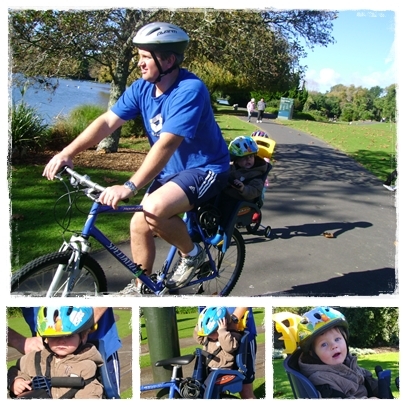 Sure, we have ridden our trike-with-trailer-attached 200 metres down the street to the park plenty of times. We know how to wait with Mummy at intersections. We can peddle no problem on the flat. But the way we're heading this time... there's hills. There's traffic. It's further than we realise. So this time, we ride with Daddy, safe behind him. But one day we will have outgrown the "baby seat" and learnt enough to keep us safe on the road. Then our Wise Daddy will cheer us on as we take to the streets. Isn't that cool? That's what my husband learnt on our family bike ride. Also loving the cushions you've been making too!!! Nice work! Um yeah, I did wonder what had happened to Scrag - I thought he'd shrunk....LOL! Wisdom indeed. He truly does know us far better than we know ourselves. A pertinent message for myself, too, at the moment:) Reading this has set me up well for the day and the weeks ahead. Thank you for your wisedom, Simone! Love this post! Visiting from SITS. Blessings! awwwl scrag looks so tiny!